Routine optical and mechanical maintenance of compound microscopes can ensure that your microscope works well for years. The microscope maintenance information provided below is not meant to replace any specific directions included with your microscope and periodic microscope servicing by a qualified microscope technician is recommended. Compound microscopes should generally be serviced after about 200 hours of use. For most schools, this would be about every three years, possibly more frequent if the microscope is used multiple times each day. There is a great article here about how to avoid microscope repairs. Most microscope problems occur as a result of improper handling. When carrying the microscope, always hold it by the base and the metal support arm. Do not pick it up by grabbing the stage, as this can cause mis-alignment for the mechanical stage. If you will be transporting the microscope frequently from one location to another you might consider purchasing a microscope carrying case. When the microscope is not in use keep it covered with the dust cover. This alone will extend the life of your microscope. Even if the microscope is stored within a cabinet, you should still cover it with the dust cover. Do not store a microscope without any eyepieces, even if it is covered. This can allow dust to collect within the eye tubes, which can be difficult to clean. If the microscope eyepieces must be removed, simply cover the tubes with caps or a plastic bag with a rubber band around the eye tube. If you are using immersion oil the high power objective lens (usually 100x) and the lens of the condenser should be thoroughly cleaned before storing. After using the microscope, turn off the illuminator and wait for it to cool for several minutes before putting it away. By allowing the bulb to cool you will extend its life. Also, make sure you do not store your microscope in an area that has corrosive chemical fumes that can destroy lenses or metal parts. Microscope lenses can easily be scratched and should be treated with great care. Never use sharp instruments or anything abrasive to clean the microscope lens. To clean the microscope eyepiece or the microscope objective lens, moisten lens paper with lens cleaning solution and clean the lens with a circular motion. You can dry the lens with a clean, dry piece of lens paper and when you are finished use an aspirator to remove any lingering dirt or particles. To determine if your microscope eyepieces need cleaning, loosen the small set screw for the eyepiece (if there is one) and rotate the eyepiece in a circular motion while looking through the microscope. If there is a dust particle that rotates as you rotate the eyepiece, remove the eyepiece from the microscope and clean both sides of the lens with lens paper. If you need to use any liquid for cleaning, distilled water is recommended. It is not recommended that you take the eyepiece apart, as there are generally multiple lenses in the eyepiece and they can be difficult to put back together in the correct order. In order to determine which of your objective lenses need cleaning, take a clean blank glass slide and put it under your microscope. Once the microscope is focused you should be able to move the slide and determine if the visible dust is moving with the slide or staying in the same place (which means the dust is on the objective lens). When using immersion oil for microscopy, the oil should always be cleaned from microscope objective lenses immediately after use. This can be done with a kimwipe of piece of lens paper, no cleaning solutions are needed. Occasionally dust may build up on the lightly oiled surface so if you wish to completely remove the oil then you must use an oil soluble solvent. For the Cargille Type A or B immersion oil that we sell, you can use Naptha, Xylene, or turpentine (use very small amounts on the kimwipe). Do not use water, alcohol or acetone as the oil is insoluble to these solvents. To remove other oily substances, we recommend using the detergent called Wisk and prepare a solution of 1 part Wisk to 100 parts water. If immersion oil was not cleaned off an objective after use and has hardened on the objective, moisten a piece of lens paper with a small amount of distilled water and hold it against the lens for a few seconds to dissolve the oil. If that does not work, try alcohol. Isopropyl alcohol is one of the best solvents but it must be at least 90%+ pure (do not use rubbing alcohol, 30% water). Everclear which is grain alcohol (you must be 21!) can also be used but it doesn't do as well in dissolving crud. If you have something like Balsam stuck on the lens, you must resort to a stronger solvent like Acetone or Xylene. Acetone should never be put on plastic parts, as it will dissolve most paints and plastic. After using solvents be sure to clean the objective again with standard distilled water to ensure that you have removed all the solvents from the microscope objective. Each microscope should come with a user's manual. Always consult this user's manual before making any adjustments to your microscope. Never over-tighten or use force when performing any maintenance on your microscope. This can damage metal parts in the microscope. The microscope nosepiece can sometimes become too loose or tight. Generally there is an adjustment mechanism on the nosepiece. A simple loosening or tightening of the slot-headed screw in the middle of the nosepiece will usually solve the problem. Check your user's manual for complete instructions. You can adjust tension of the fine and coarse focusing knobs. 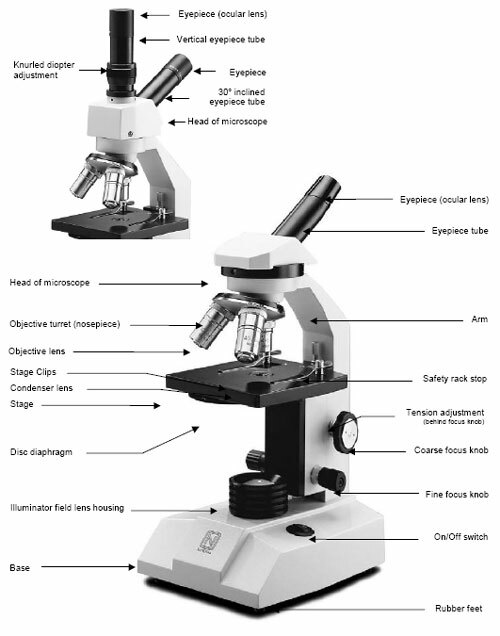 Some microscopes are adjusted by turning the knobs on each side of the microscope in opposite directions. Other microscopes will have adjustable collars on the shaft and require the use of special wrenches to make adjustments (these usually come with the microscope when purchased). Moving the collars out usually provides more tension. On an annual basis moving parts on the microscope should be cleaned and lubricated. Clean grease and dirt from sliding surfaces using a clean cloth. Apply a very thin layer of lithium-based grease to the sliding surfaces. Do not grease the teeth of the rack and pinion gears. 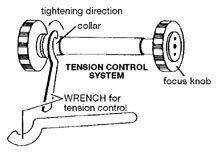 After lubricating, if the coarse adjustment moves too freely, adjust the tension knob as described above. Microscope bulb replacement instructions can be found in the microscope instruction manual. Be sure to use the correct replacement bulb. Always allow the bulb to cool before replacing it. Avoid touching the glass of the bulb with your bare hands, as fingerprints and particles of dust left on the bulb can burn into the bulb and reduce the life of the bulb as well as the quality of the light produced by the bulb. LED light bulbs tend to last the longest, generally 100,000 hours. In comparison, tungsten bulbs generally will not last longer than 100 hours.